Cozy cottage on beautiful Lovewell Pond. Secluded setting with private sandy beach, dock and swim platform. Canoes and kayaks provided with life jackets. Mountain views all around. Enjoy a cookout using the gas grill on the back deck, and then toast marshmallows over the fire pit. Three bedrooms provide enough sleeping room for up to 8 people. Bring your own linens and towels. Cable TV, DVD, Stereo and free Wi-Fi available. We have always dreamed of owning a cottage on a lake and this is the perfect setting. We fell in love with it the minute we saw it. It is off of the main road making it the perfect setting for small children. The sandy beach and beautiful mountain views are breathtaking. It is the perfect place to get away from all the hustle and bustle of every day life, but still close enough to all of the attractions of the White Mountains if we want to enjoy them. 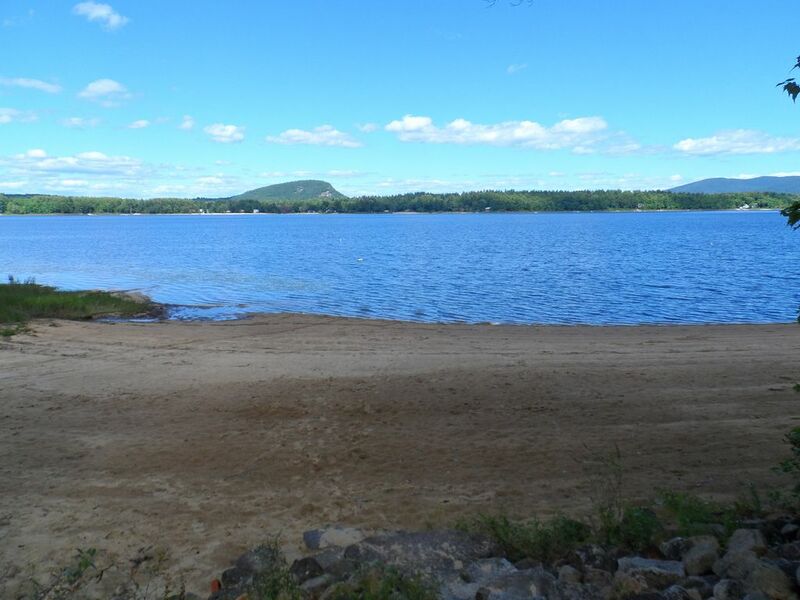 Enjoy 200&apos; of beautiful sandy beach on Lovewell Pond, relax on the swim float, or go for a canoe ride around the lake. Beautiful mountain views all around. Great spot for families with active members. My teenage kids had a blast using the kayaks, canoes, and row boat! Home was very nice and well maintained. Would definitely stay again! The property was great, I really appreciated the air conditioners. The back deck was very nice for enjoying lunch or dinner outside. I really appreciated the firewood being provided that was a big benefit. My family and I had a great time. Thanks for letting us rent your home for week. Great spot. Beach is super kid friendly. The bedrails and baby gate were a great help with my 2 year old. Very relaxing week! The beach and the views cannot be beat! We had a great time at this property. It was very private and peaceful. The large beach was great for our young toddlers. The home was very clean and met all of our needs. We also enjoyed being so close to Saco river for a fun day trip. Those only downside was there were tons of mosquitos at all times of day. (I know this is not the fault of the owners.. just part of being in the woods). I would definately rent again. We had a fantastic time at the cottage. Very well stocked, everything you need for a fun week at the lake. Beach, dock and lake access were perfect for kids. Just a 15 minute ride to North Conway and a short jaunt to all of the attractions in the White Mountains area. Canoes are provided with rental, but if you want bring your own motor boat, the boat launch is about a mile up the street. Check-in anytime after 4:00 pm on Saturday. Check-out by 11:00 am on following Saturday. Please note that the pond water levels can fluctuate greatly and tend to be high in the spring and early summer and after heavy rain.